While at Somalisa Expeditions in Hwange National Park last year, I met long-time visitor to Zimbabwe and champion of conservation, John Gillon. Over lunch, he showed us his black and white Rhodesian driving license from the 1970s and told us about how much it has changed over the years. At 73 years old, he has spent a lifetime working to conserve the wildlife in Hwange and shows no sign of slowing down. I was born in Edinburgh and after leaving school I started working for one of the biggest medical publishers in the world. After having worked with the same company for eleven years and having been around a bit, I decided to try going overseas to work. I wrote to several companies abroad whom I had dealt with and the best offer came from South Africa. I decided to emigrate to SA and started a job in Johannesburg. I was still single at that time so could take a chance. Once in SA, I wasn’t too happy but didn’t want to come home so soon. After a year, I got a job in Rhodesia (now Zimbabwe), I arrived in Salisbury (now Harare) in October 1970 and it looked so wonderful with all the Jacaranda trees in full bloom and all the people, both black and white, were so friendly. I had a great time but as the war of independence started to get worse, many hotels in the tourist spots closed as nobody wanted to travel on the roads, so I decided to return home after living in Rhodesia for seven years. While in Rhodesia, I had visited Hwange National Park (it was called Wankie in those days) several times and loved the wildlife. 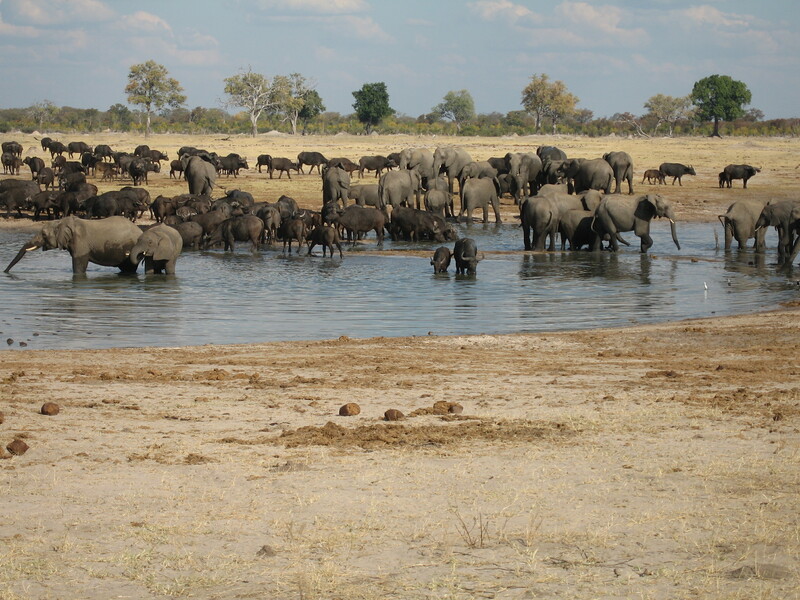 What made you set up the Hwange Conservation Society and how did you do it? 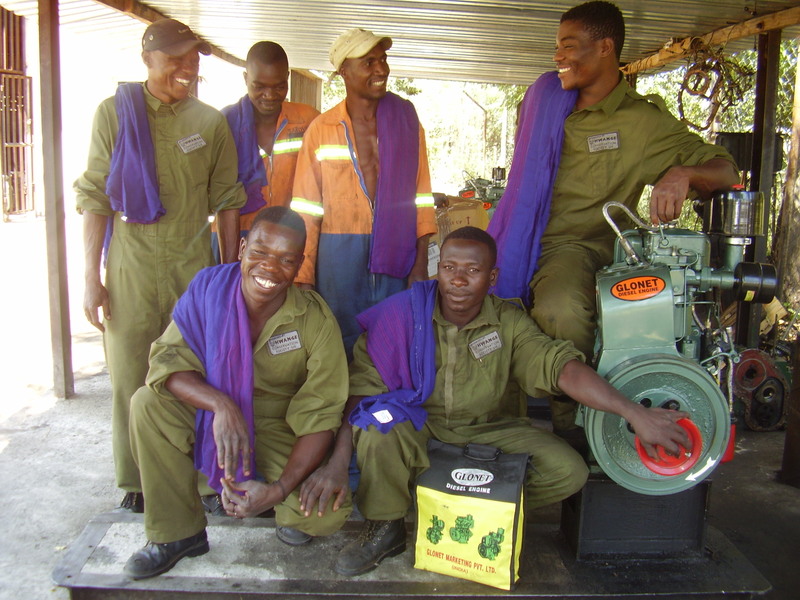 The Hwange Conservation Society was started in the small mining town of Wankie by many of the residents who worked for the mines. They used to go into the Park and help with the boreholes etc. as the Park was underfunded. A chap from Aberdeen, Alan Main who lived in London and had connections with some of the people in Wankie, started up a branch in the UK and registered it as a charity. I saw an advert looking for members in the UK so contacted Alan and joined as a member. These were early days and we couldn’t do a lot from this end apart from take some medical supplies over when visiting. After a couple of years, Alan advised that he was being transferred overseas by his work and as such, couldn’t continue to run the charity. A few of us decided to go to London to see Alan and agree where we would go from there. It was decided that I would be Chairman and Anne Wilkinson would be treasurer/secretary. We started to try and improve things and one of the first things we did was to purchase a second-hand Land Rover and have it repaired. We were going to ship it out to South Africa and my wife and I were going to fly to Durban and drive the vehicle up to Zimbabwe. However, before we left they would not give us the necessary paperwork, so we had to send it up by container and my wife and I flew up to collect it. By this time, I had visited Zimbabwe with my wife several times and she loved the place from the first time she stepped off the plane. It was always slightly difficult to arrange sending goods over to Zimbabwe due to the huge transport costs and the tax which had to be paid to the Zimbabwe government. We did, in the end, manage to overcome this problem by working with a local charity, Wildlife and Environment Zimbabwe (WEZ). I sent a letter of donation to WEZ who applied for a duty-free certificate, which allowed the goods in duty-free, saving a good amount of money. This system has been working now for many years. Twenty years ago, on one of my visits to Hwange National Park, I was approached by a member of the parks staff, who asked if we could help him financially. He had been accepted to Bristol University to do a mechanics course, so I said I would see what we could do. On my return home, I decided it would not work due to air fares, accommodation and living costs, but contacted some people in Bulawayo. They managed to get Owen a two-year training course at a garage, so long we paid Owen’s wages for two years and paid for his tools etc. After the two years were up, Owen returned to Main Camp and began working in the vehicle workshops, which donated a good supply of spare parts and Parks were very happy with the outcome. A few years later, the Park suffered a severe drought and many of the waterholes dried up, but also many of the diesel engines, which pump the water into the waterholes, were broken. I contacted the then Director General of the Parks and suggested that if he promoted Owen to take charge of the Game Water Supply Unit, he would solve the problem and that we would supply spare parts and diesel fuel for the pumps. This he did and within a month Owen had 20 pumps up and running. Owen is still in the same position today, in charge of Game Water Supply. Over the years, we have donated 44 diesel engines for the boreholes, plus loads of spare parts and many litres of diesel fuel. The situation has changed a bit in recent years, as we are now moving over to solar powered pumps, which is proving to be very effective. Several years ago, we also donated a dart rifle to a chap called Paul de Montill, who ran his own safari camp, so that he could dart any snared animals and release them. He founded D.A.R.T (Dete Animal Rescue Trust) in 1999. For ten years, British Airways supported HCS by giving us free tickets to fly Club Class to Zimbabwe, and also to bring conservationists to the UK to give presentations on their work in the Park. We hope to continue to support the game water supply and we are also helping with anti-poaching via supplies of fuel for vehicles and various other equipment. What does ‘conservation’ mean to you? Conservation means being able to help the animals and keep them for future generations. What is the greatest lesson you’ve learned so far as a conservationist? It is wonderful to go to National Parks and see all the animals in their natural environment, and although at times it might be looking bad, just keep trying. What advice would you give to other conservation enterprises? You shall always come up against problems but just keep trying, even when things don’t look too good. We have often come up against problems but just kept fighting until we got things right. 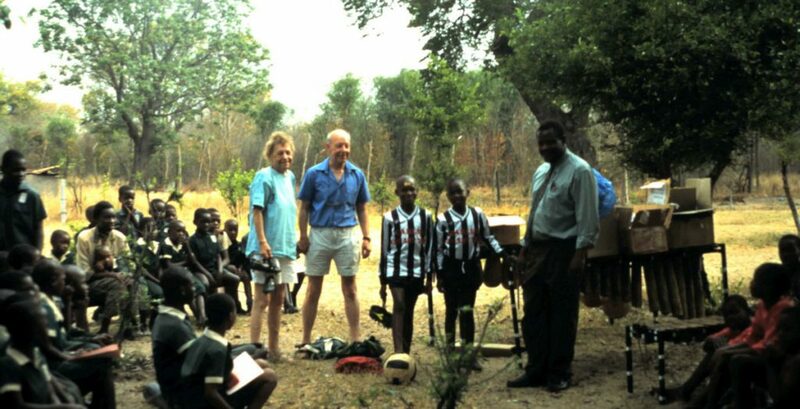 Main image: John and his late wife at Main Camp primary school, donating football kits in 2006. What a life well lived and what an inspirational message to all of us working so hard to protect Africa’s incredible wildlife. If you are interested in travelling to Zimbabwe, or would like to discuss how you can help protect Africa’s wildlife, please contact Wild Philanthropy. The Game Water Supply Unit are all wearing overalls donated to them by HCS. British Airways donated 200 of the flight blankets they are holding.